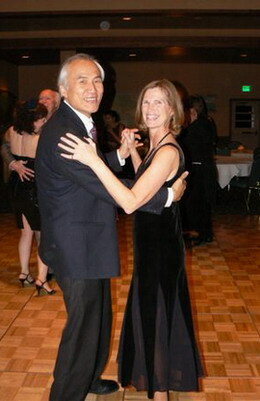 Ballroom Dance Club of Fairbanks, Anchorage Classical Ballet Academy, Center Stage Dance Studio, Children's Dance Theatre, are just a few of the dance companies, Alaska dance schools, dancing organizations and dance wear suppliers that that can be found in our comprehensive Directory of Alaska Dance Companies. A CERTIFIABLY FUN PLACE TO DANCE ! Dance Classes: We currently have five excellent teachers offering several 6-week series of dance lessons in September through May. A weekly practice session for all dances currently being taught in classes. Dance Workshops with visiting Master Teachers such as with U.S. National Latin Dance Champion Marie Roberts. Bimonthly Dances - We sponsor smoke-and-alcohol-free dances on the first Saturday and third Friday of each month, 8:30-11:30 p.m. at the Pioneer Park Dance Hall. Some dances include a lesson from 7:30-8:30 p.m.
Special Events - We host one or two formal-semiformal dances each year at venues such as the Princess Edgewater Room, and we co-sponsor the annual Fairbanks Symphony Ball. E-News - A weekly e-newsletter on upcoming dance events. There are many fine dance schools in Alaska. I know I am in contact with them as we supply a range of high quality dancewear products like leotards, dance pants, dance dresses and other dancing apparel. Bangkok Companies supplies an amazing range of dancewear from Thailand. I have looked at these dance garments and dance accessories in detail. There is only one word to describe them Superb. For more details click on the pictures or send an email to bangkokcompanies@gmail.com We regret at this time we can only satisfy Alaska wholesale dancewear requests. PO Box 6118 AK 99901 Ketchikan, Alaska U.S.A.
P.O.Box 81197 99708 Fairbanks, Alaska U.S.A.
PO Box 83847 AK 99708 Fairbanks, Alaska U.S.A.
Post Office Box 241543 9524.1543 Anchorage, Alaska U.S.A.
Instructor and choreographer for all aspects of Social, Ballroom, and Latin dance with emphasis on Argentine Tango and Latin. Company is available for fully staged performances. Performances include Jazz. P.O. Box 141464 AK 99514 Anchorage, Alaska U.S.A.
PO Box 22225 AK 99802 Juneau, Alaska U.S.A.
2602 Gambell Street AK 99503 Anchorage Alaska U.S.A.
501 W. International Airport Rd., Suite 22 AK 99518, Anchorage, Alaska U.S.A.
12551 Old Glenn Highway AK 99577 Eagle River, Alaska U.S.A.
1317 East 74th Avenue AK 99518 Anchorage, Alaska U.S.A.
10520 L Street AK 99506 Elmendorf Afb, Alaska U.S.A.
4000 West Dimond Boulevard AK 99515 Anchorage, Alaska U.S.A.
PO Box 2613 AK 99686 Valdez, Alaska U.S.A.
2017 South Cushman Street # 100 AK 99701 Fairbanks, Alaska U.S.A.
1300 East 68th Avenue AK 99518 Anchorage, Alaska U.S.A.
1601 East Parks Highway AK 99654 Wasilla, Alaska U.S.A.
245 West Nelson Avenue AK 99654 Wasilla, Alaska U.S.A.
1303 20th Avenue AK 99701 Fairbanks, Alaska U.S.A.
PO Box 90566 AK 99509 Anchorage, Alaska U.S.A.
PO Box 92442 AK 99509 Anchorage, Alaska U.S.A.
206 4th Street AK 99801 Juneau, Alaska U.S.A.
400 Mission Street # 205 AK 99901 Ketchikan, Alaska U.S.A.
Beaverbrook Mall AK 99705 North Pole, Alaska U.S.A.
282 South Flower Street # B, Alaska AK 99508 Anchorage, Alaska U.S.A.
PO Box 296 AK 99615 Kodiak, Alaska U.S.A. Corner of Haller & 2nd AK 99611 Kenai, Alaska U.S.A.
914 College Road AK 99701 Fairbanks, Alaska U.S.A.
1800 College Road AK 99709 Fairbanks, Alaska U.S.A.
Mi 88.3 Sterling Highway AK 99669 Soldotna, Alaska U.S.A.
535 2nd Avenue # 202 AK 99701 Fairbanks, Alaska U.S.A.
620 East 57th Pl AK 99518 Anchorage, Alaska U.S.A.
432 East Pioneer Avenue # A AK 99603 Homer, Alaska U.S.A.
1413 West 32nd Avenue AK 99503 Anchorage, Alaska U.S.A.
177 East Bunnell Avenue # 3 AK 99603 Homer, Alaska U.S.A.
19709 1st Street AK 99577 Eagle River, Alaska U.S.A.
7010 Scalero Circus AK 99507 Anchorage, Alaska U.S.A.
197 Shady Lane AK 99669 Soldotna, Alaska U.S.A.
4115 Woodland Drive AK 99615 Kodiak, Alaska U.S.A.
PO Box 10-2458 AK 995110 Anchorage, Alaska U.S.A.
PO Box 240565 AK 99524 Anchorage, Alaska U.S.A.
3901 Old Seward Highway, Suite 17E AK 99503 Anchorage, Alaska U.S.A.
7721 Ascot Street AK 99502 Anchorage, Alaska U.S.A.
6175 Poachers Cove Street AK 99669 Soldotna, Alaska U.S.A.
PO Box 34199 AK 99803 Juneau, Alaska U.S.A.
PO Box 243281 AK 99524 Anchorage, Alaska U.S.A.
3211 Providence Dr. AK 99508 Anchorage, Alaska U.S.A.
5841 Arctic Boulevard AK 99503 Anchorage, Alaska U.S.A.
14730 Turnagain Bluff AK 99515 Anchorage, Alaska U.S.A.
1145 Walnut Street CA 94707 Berkeley, California U.S.A.
400 East Street AK 99801 Juneau, Alaska U.S.A.
3875 Geist Road (E323) AK 99709 Fairbanks, Alaska U.S.A.
1335 Primrose Street AK 99508 Anchorage, Alaska U.S.A.
2512 Lisa Ann Drive AK 99705 North Pole, Alaska U.S.A.
732 14th Avenue North WI 54650 Onalaska, Wisconsin U.S.A.
620 East 57th Place AK 99524 Anchorage, Alaska U.S.A.
PO Box 83334 AK 99708-3334 Fairbanks, Alaska U.S.A.
635 Fischer AK 99518 Anchorage, Alaska U.S.A.
PO Box 230686 AK 99502 Anchorage, Alaska U.S.A.
2602 Gambell Street AK 99503 Anchorage, Alaska U.S.A.